This is a re-post of a piece I wrote last year. 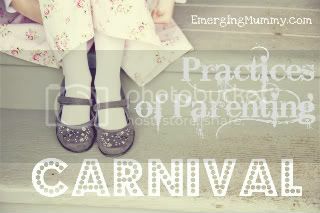 I wanted to include it in this week’s Practices of Parenting Carnival over at Emerging Mummy. Sarah Bessey was kind enough to invite other bloggers to share what we do (or try to do) to help us enjoy parenting, and for me, pointing my kids to Christ is what makes mothering not easy and sometimes not enjoyable but definitely worth it. I hope this post proves that. Crying, yet again. Thank you Meghan. That is so profoundly deep. Such a great challenge to mother’s to truly trust Him in all things, especially those most precious to us. Thank you for sharing! And thank you, Amanda, for stopping by and commenting! There is, indeed, freedom here. Thanks, Sarah, for hosting such a phenomenal event. And thank you so much for reading and commenting on my small contribution. XO back at ya. I read this yesterday and mulled over it for a bit. I hope you will allow me to share a different perspective that is just as biblical and perhaps more healthy in the long run. I think we look at Jesus’ sacrificial death as a model, sometimes, but He did not allow Himself to be mistreated His entire life. He openly corrected His parents, the pharisees, and the disciples. He was “among men but did not entrust Himself to them, for He knew their hearts.” He shared things with his 12 disciples, but only personal moments with 3 of that group. Throughout His life, we see healthy boundaries in place until Gethsemane, where He makes the decision to give His life up for humanity. In order for us to parent well, we can’t teach our children to be martyrs, but rather, how to have healthy relationships, strong boundaries, how to forgive, and when to reconcile. It would be better, in my opinion, to teach them the principles of Mt. 18, to go to those who have wronged us to give them a chance to make it right. If it isn’t better, bring others (parents, teachers) to see if things can be resolved through mediation. But in the end, if someone just wants to be a jerk, we can not have that person in our inner circle because they will continue to hurt us. Yes, good thoughts here, Deanna. Your words lend a nice balance to what I wrote. And my daughter and I eventually got to this part of the process. But in the thick of those “hurt feelings,” I really just wanted my girl to trust Jesus with her pain. And I had to trust Him with mine as well. Thank you for sharing your sage perspective! Calumniated means to be misunderstood. Hate being misunderstood! Thanks for your comments, Mom. I love you!